The South African government will increase the basic daily wage of farm workers by 52 per cent following violent strikes in the wine-producing Western Cape region. The minimum daily wage will be raised to 105 rand ($11.77) from 69 rand from March 1, with a further increase of 1.5 percentage points above the consumer inflation rate for the following two years, labour minister Mildred Oliphant said. 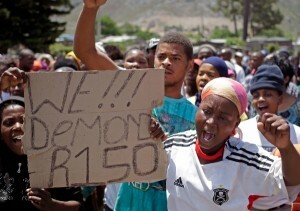 An increase in wages follows violent pay-related strikes in the Western Cape province that claimed three lives and severely effected fruit harvests. “It is time to begin working together toward a vision for the farming sector, one in which the sector expands and creates jobs and where there are better relations between farmers and farmworkers,” Oliphant told reporters in Pretoria. The number of farm workers stands at about 680,000 and employment levels have slumped by 30 per cent over the last decade according to Agri SA. President Jacob Zuma has called for business leaders and the government to work together to promote brand South Africa.